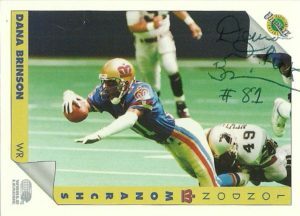 Dana Brinson was one of the most dangerous speed merchants to hit the WLAF during its short time. He was one of the few names I recognized right off the bat when the league was formed and I felt that London already had an unfair advantage with his speed and pedigree on offense. 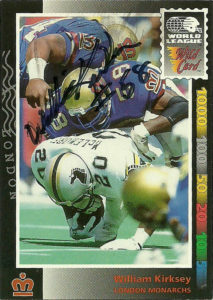 Selected by the Monarchs as a wide receiver in the first round of the inaugural WLAF positional draft, Brinson originally played runningback in college and early in his NFL career, but produced for London as a jack of all trades. His statline was pretty loaded in 1991: 28 catches for 351 yards and a TD, 4 carries for 47 yards and a TD, 31 punt returns (tops in the league) for 181 yards, AND 12 kick returns for 317 yards and a 93 yard TD (first in league history). His best game came arguably against the Knights, when he had 8 receptions for 114 yards. 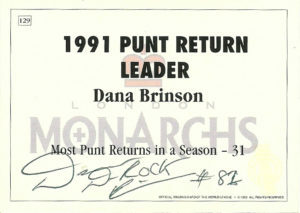 Dana was injured during the Monarchs World Bowl I victory, but still earned second-team All-World League Honors at the conclusion of the season. He did not return to the team for the 1992 season. Dana Brinson originally played ball for Nebraska from 1985 to 1988. Clocking in at 5’9″, 165, Dana was an all around threat as a RB, PR, KR and WR at wingback. He’d have 330 yards on 27 punt returns in 1986 leading the Big 8. Later he was voted the Big 8 All-Conference Kick Off Returner when he had 510 yards on 23 returns, and he also led the conference in punt return yards with 196. During his time at Nebraska he’d score 2 TDs on punt returns and finish with 1154 career kick off return yards. 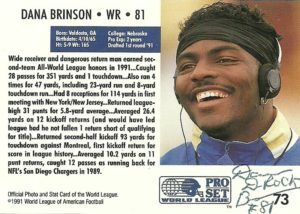 A member of the prestigious 1989 draft class, Brinson was selected in the 8th round by the San Diego Chargers. He did not endear himself to teammates or fans by saying that he’d unseat Lionel James -but he did just that. He finished his only season in SD with 17 carries for 64 yards, 12 receptions for 71, and 11 returns for 112 yards. Somehow he even started at H-Back during the season, but a burner sidelined him for a few games. Later, Dana signed with the Falcons in 1990, but did not make the squad. 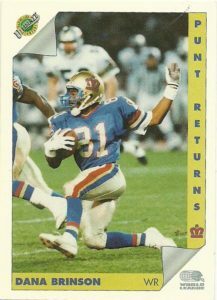 Dana had 3 outstanding action cards, and I had been trying to locate him since the beginning of the WLAF project. Recently I saw that an unsavory EBayer was selling his autograph online and that got me to searching. Eventually, I was able to finally locate him through Facebook. He signed these 3 cards with a donation in a very short time. He was very touched to know how his former teammates were doing. In 2009 Dana was elected to the Nebraska Football Hall of Fame. Fred McNair finished his career at Alcorn State as the 5th leading passer in NCAA -1A football after completing 119 of 214 passes for 1,898 yards and 14 TDs. After not being drafted in 1990, Fred was signed by the Dallas Cowboys to compete in camp against Babe Laufenberg– where I’m sure Fred passed me walking down autograph alley at St. Edwards in Austin. After being cut, McNair played for the Toronto Argonauts of the CFL where he was a member of the 79th Grey Cup Championship team. 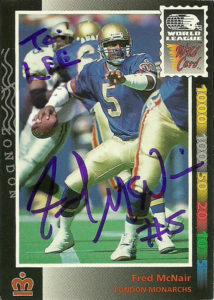 Fred made the move to the WLAF in 1992, signing with the London Monarchs. Although McNair was incumbent starting QB Stan Gelbaugh‘s backup, Fred did see significant playing time for the Monarchs. He’d throw for 668 yards and 3 TDs during his brief stint in the league. After the season, McNair returned stateside and began a solid career in the Arena leagues playing for the Albany Firebirds (1993-1995), Florida Bobcats (1996-2000), Carolina Cobras (2000-2001), and the Buffalo Destroyers (2002). He also helped tutor his younger brother Steve for the rigors of the pro level. Football hasn’t really stopped being a part of Fred McNair’s life. He spent some time at Millsaps University honing his skills as a coach, then jumped in at the OC level working with Mount Olive, (MS) helping the Pirates earn two State titles. After that he was head coach at Collins High School (MS), returning to Alcorn State in 2012 to serve as offensive coordinator. In 2016 Fred became head coach of his Alma Mater, where he led Alcorn State to a 1st place finish at 5-4. I had been meaning to get Fred on his Wild Card for some time, but I wasn’t sure if he signed TTM. I finally gave him a shot and was pleasantly surprised to get him in about 40 days. William Kirksey played collegiality for Southern Mississippi where he first gained recognition during the 1988 Independence Bowl. He led the team with 12 total tackles as the Golden Eagles sliced the UTEP Miners 38-18. The following year he was a team captain of the defense and led them with 146 total tackles. During that season he set the school single game mark for total tackles (21) and assisted tackles (19) against Louisiana-Lafayette. At the conclusion of the year Kirksey was named Second Team All-South Independent. He went unnoticed in the 1990 NFL draft, but was signed as a free agent by the Minnesota Vikings, dressing for 9 contests. Near the end of the year, he was signed to the Falcons practice squad. 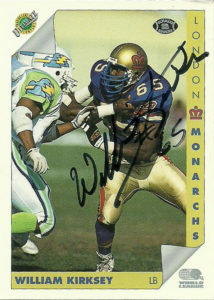 William was selected in the 3rd round of the WLAF draft in 1992 by the London Monarchs. Despite the team’s woes in the standings, William had a solid campaign, recording a sack, and returning an interception 27 yards to paydirt. After the season, William signed with the Kansas City Chiefs, but was placed on IR before the season even began. In 1995, he played briefly in the CFLUSA initiative with the Birmingham Barracudas notching 2 tackles. 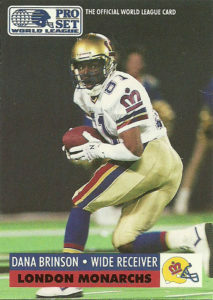 After playing for the Montreal Alouettes in 1996, William retired from playing and went into coaching. He’s coached at the High School and JC level for many years, as a defensive coordinator, positional coach, and recruiting coordinator. I had been looking for Kirksey for sometime and had some near misses. Finally I decided to pay to play with Spokeo, and with the data I had already on his football cards, I was able to track down a working address.